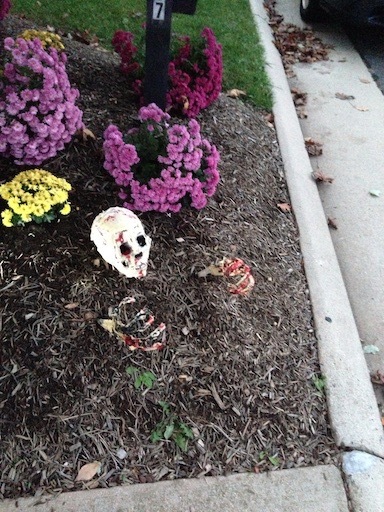 I am always interested in experimenting with Halloween decorations and in recent years have added a few aspects of technology to them. 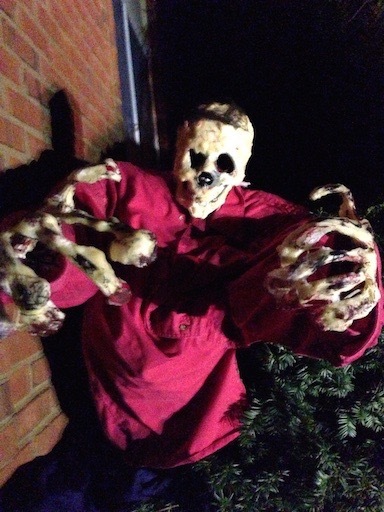 For the prior couple of years I experimented with simple animatronics where zombies appeared to have some motion such as attempting to crawl or moving legs sticking out from under a garage door. 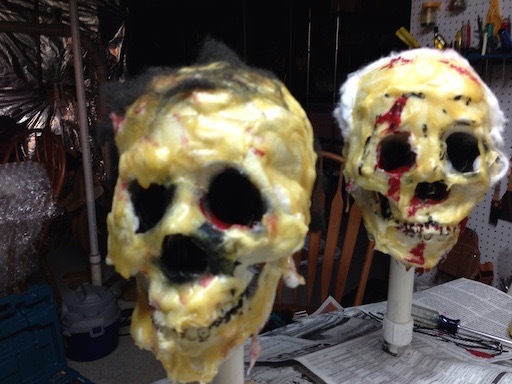 My zombies are primarily homemade where I bought skulls and then used liquid latex, cotton balls, paint and other things to “bring them to life”. I would then use PVC pipe to construct some basic body parts such as legs, arms or a torso and then attach the skull to them. Once made these are long lasting and weatherproof so you can easily set them outside and not worry about them. 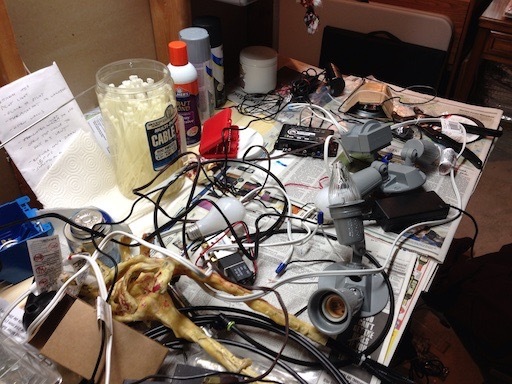 Wiring together some simple motion sensors and strobe light triggers can also be fun (and a bit cluttered). 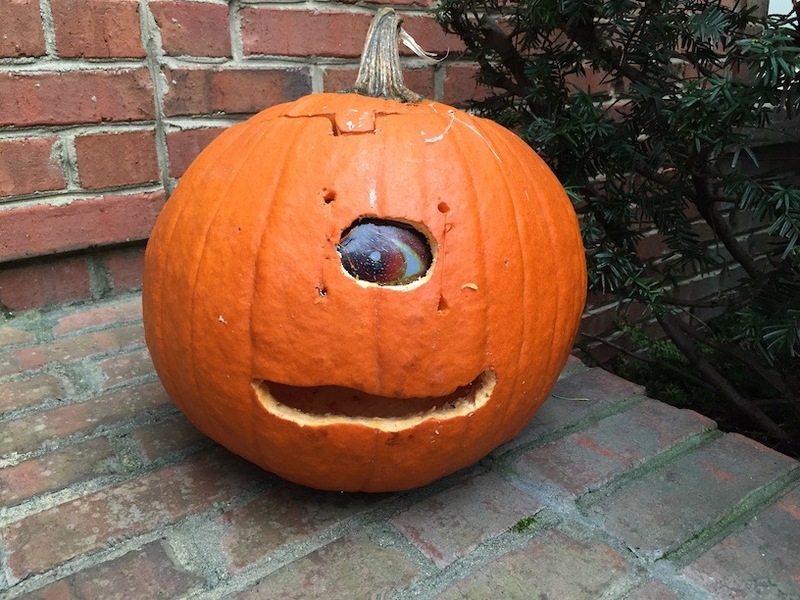 This year we tried making a pumpkin with a moving eye which was just a pumpkin with a Cyclops style eye hole and mouth cut into it. An iPhone behind the eye hole allowed it to continuously loop a video of a scary eye. Finding a way to hold the iPhone was a little bit of a challenge but we settled on putting the phone in plastic wrap and then using thread to keep it in place. 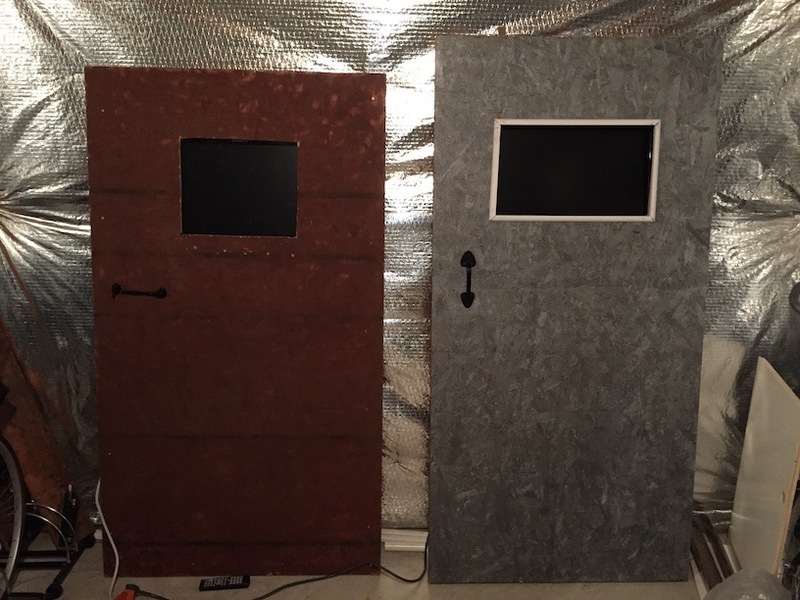 This year I decided to make Zombie containment doors, something that looks like a door or panel with a window to a room. Inside the room is a Zombie or some other evil thing that approaches the door and does something scary. What I did was mostly off the cuff other than researching the media players. Planning the monitor frame for using different sizes in the future would have been more flexible in the long run but doing it all on the fly worked out reasonably well for this use. I wanted to use as much as I could find around the house but did have to buy a few items primarily the digital media players and videos. 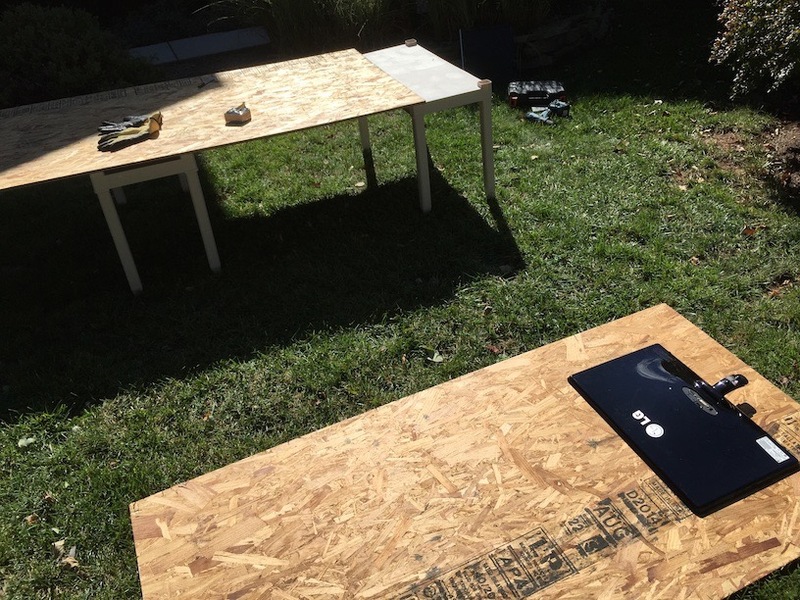 I used plywood for the doors which worked out ok. Note that you have to be able to cut holes in them for the monitors to show through and you need to plan how much of the monitor to show. You may also need access to the power button on the monitor if it does not come on when the power strip is turned on. I used 2x4s or smaller for framing behind the plywood for sturdiness and to mount or hold things to the back of the door. These keep the plywood firm if it is thin but also add weight to the project. Remember that the more wood that you use the heavier the door will be. 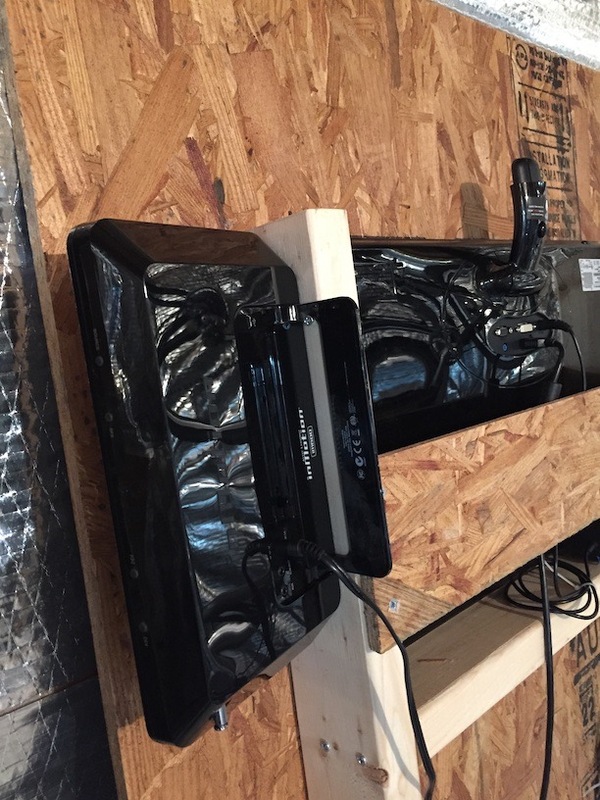 Install a power strip so that a single extension cord is required to run the door. 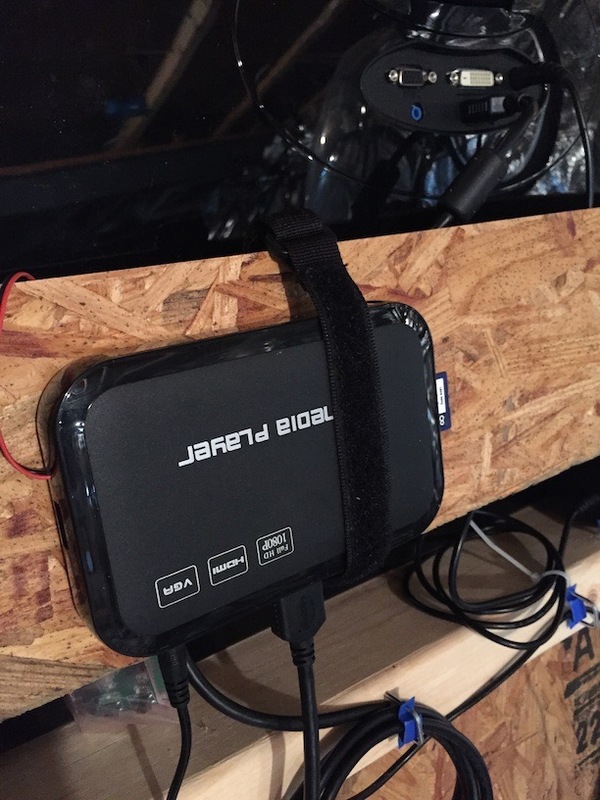 Velcro strips made attaching the electronics much easier. Just cut a piece of velcro and nail it to where you want to place your electronics. 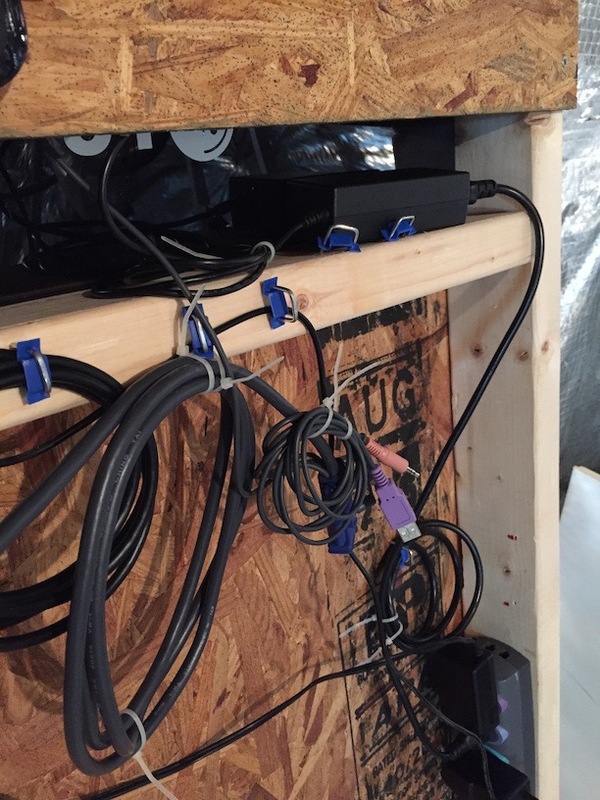 Zip ties of various sizes are always useful for keeping cables from being all over the place. Digital media players are solid state devices that load video files from a SD card or USB flash drive and then play the files. A useful tidbit for planning purposes is that you may want more than just a single video file that contains your scary scene. 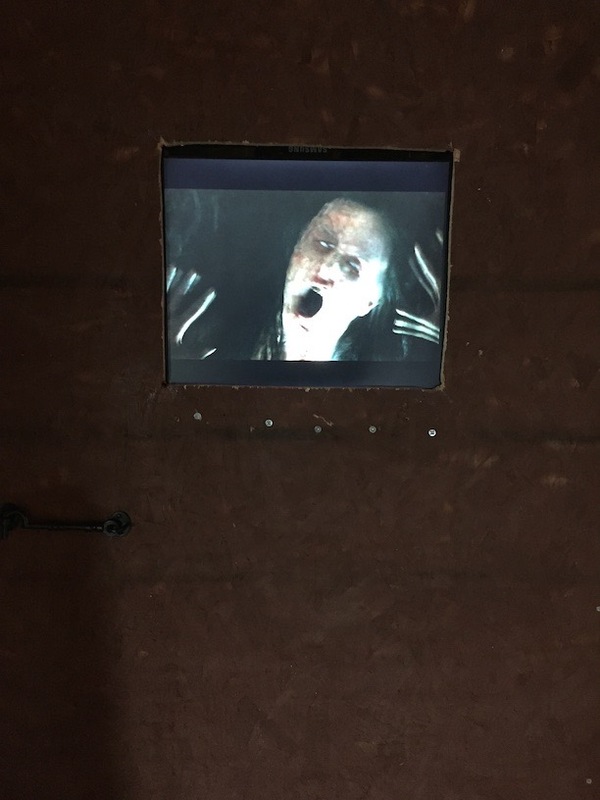 If your door has a motion or other sensor on it you may want to use a black or other video that plays until the trigger event causing the scary video to play. 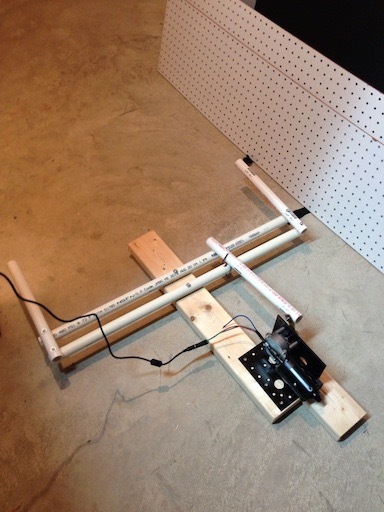 Find a powered speaker or radio with an aux input. This should be something that you can mount to the back of the door so that the sound appears to come from the door. 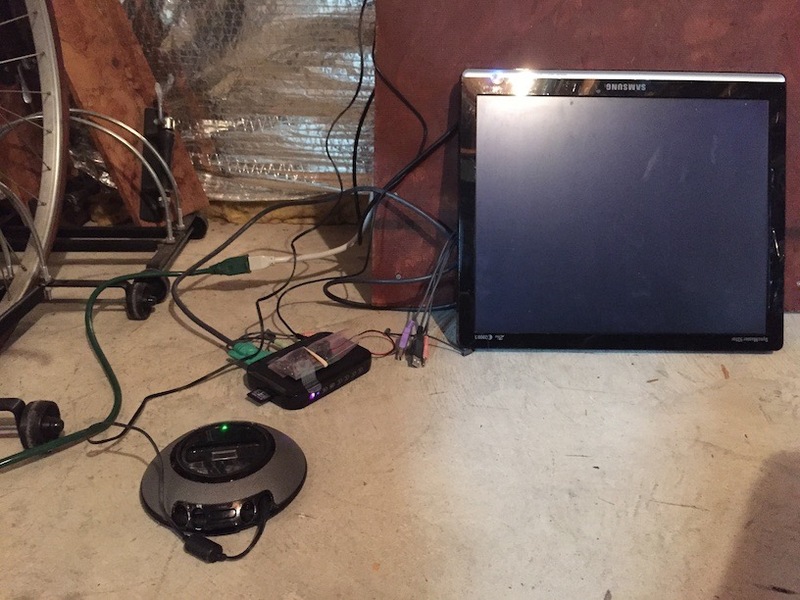 Use old LCD monitors (or TVs) for the videos, you do not need high end models but digital inputs (such as HDMI or DVI) can be helpful. The media players that I used support VGA style output so that may be good enough. 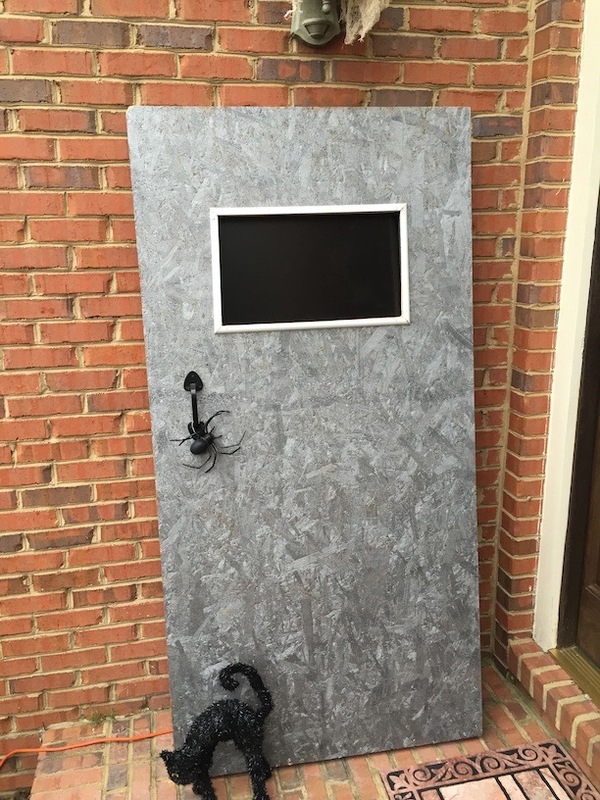 One thing to note is that on one door I used a VGA monitor and had to use the media player remote control to switch to VGA output mode every time I powered it up. If I did not switch the mode it would use another mode and the video would be entirely red and audio had a lot of noise. Switching to VGA output worked perfectly. You will need video files that are scary, well made ones will probably produce the best result. The attention to detail, acting, make up and so on all contribute to the realism. Hi-Rez Designs has a number of videos that come in different sizes, orientations and resolutions making it very easy to select what you need for your configuration. The primary aspects of building the doors involved cutting the opening for the monitor and the framing to hold the monitor and other electronics. Depending on the monitor it may be easier to install it upside down because of the potential stand stem for it being in the way when right side up. Note that this means that your video will have to be upside down unless you have some other means of playing it that way. Hi-Rez Designs (where I bought my videos) provides right side up and upside down versions of each of the resolutions making it convenient. It is a good idea to install your cables with some sort of strain relief on them so that you do not have anything pulling on anything else. 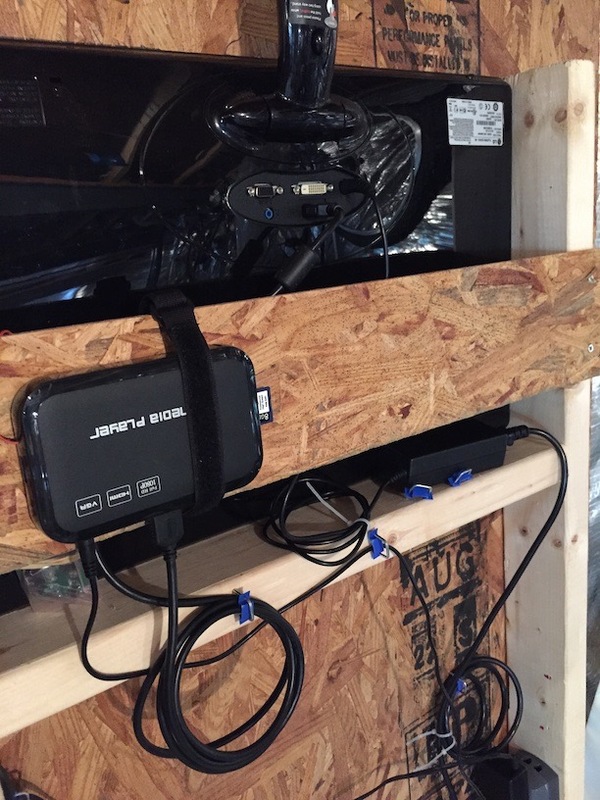 Note that there will be cabling for power to several devices, audio to the speaker and monitor output. Trying out the full electronics package on door2. Once you get the devices placed where you want them then run the cables in a way to makes them easy to follow and not be in the way. The following is how one of my doors looked from the back when almost complete. The doors should be painted in advance using paint that adds to the realism and it may be best to have them not look pristine. This speaker was a cheap radio that I had laying around for years and worked very well. The media players are small solid state devices that have slot for media files storage, some buttons for control and outputs for video and control circuits (which I did not use this year). The monitors need to be mounted in a way that makes them easy to remove so sliding them up and out worked well for me. 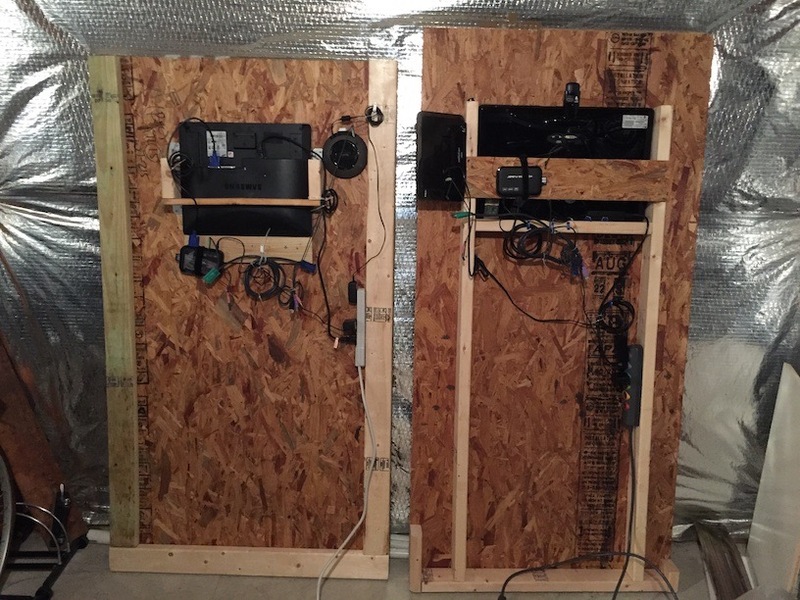 With my first door I probably made it too secure so on the second I tried a minimalist monitor frame. The video worked very well on the first door. For the second door I made the opening too large. The video itself ending up being less than the monitor size because it was not the same aspect ratio but still turned out ok. I should have measured the size of the actual video on the monitor and not the monitor itself. This is how the doors looked from the front when finished. The doors turned out ok and a number of people thought that they looked very good. Having the doors not be a part of a wall or something similar probably detracted from them in terms of realism. The pumpkin iPhone battery ran down just a bit before we closed the display down but ran well until then. We received a number of comments from people on how unique that it was. The plywood that I used for one door was 3/4 inch which is heavier than it needed to be making it a little more difficult to move around. The other door was 1/2 inch making it easier to move around. It would have been good to accommodate feet to let the doors stand by themselves instead of leaning against a wall or garage door. However, note that standalone means someone might be accidentally pull them over so you might need to have some means of securing them. Using some better planned structure to attach or mount monitors that would accommodate different sizes in the future might be helpful (otherwise you are stuck using the same monitors again). 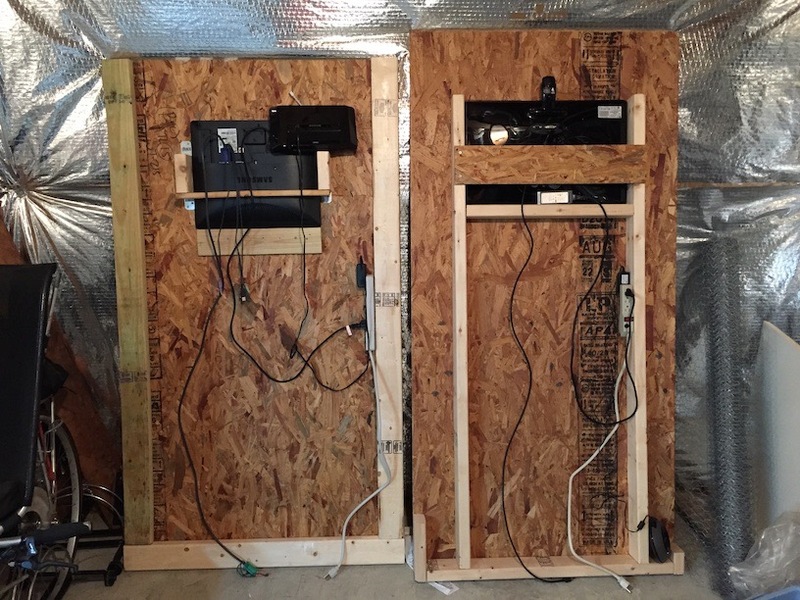 The building of the doors, mounting of electronics and then integration of all of the components (video/sound output, power, media player, motion sensor, output control) can take a while so you should start early in the build. When doors are standalone they do not necessarily look like doors. Having them next to a wall or something similar would make them more realistic. On mounting the monitors you might need to access buttons on the front after powering them up so the opening in the door might need to be larger than just the dimensions of the display. Having a means of charging the pumpkin iPhone while it was in the pumpkin would have been helpful to ensure that it runs for the entire evening. You may have to accommodate poor weather conditions which means that the electronics could be an issue. We were very fortunate with perfect weather this year so it was not an issue. Had there been rain an alternative would have been to put the doors in the garage. 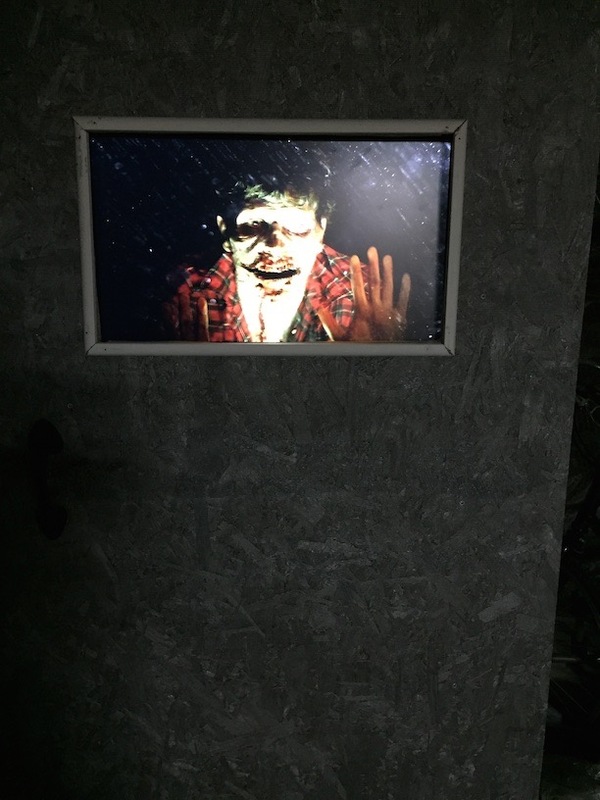 I hope to add the motion sensors to trigger the scare videos when someone approaches the door. I would also like to add a device to cause the door to vibrate when a zombie appears to strike it. Finding a better means of making the door look like a door would improve the overall experience. Here are links to what I bought or used. hi-rezdesigns.com - I was very satisfied with their support and what I bought from them. LoopTube - An iPhone app that would continuously loop a YouTube video, this worked very well.